PVC, a cheap, durable polymer useful for all types of pipes and potato guns, has long been a go-to Maker material. 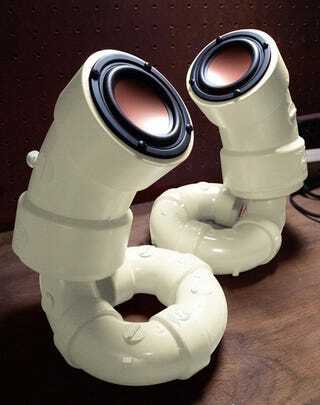 But these Sea Cucumber speakers, available on Etsy for $200, are the rare pipes that shouldn't be hidden. I'm not sure that they actually look like Sea Cucumbers. I'm not really sure what they look like (my onet hought was the garbage compactor monster from A New Hope? Maybe?) But I do know that they look pretty, and I wouldn't mind having them sitting around in my apartment, not even conveying any water or waste or shooting potatoes or anything at all.